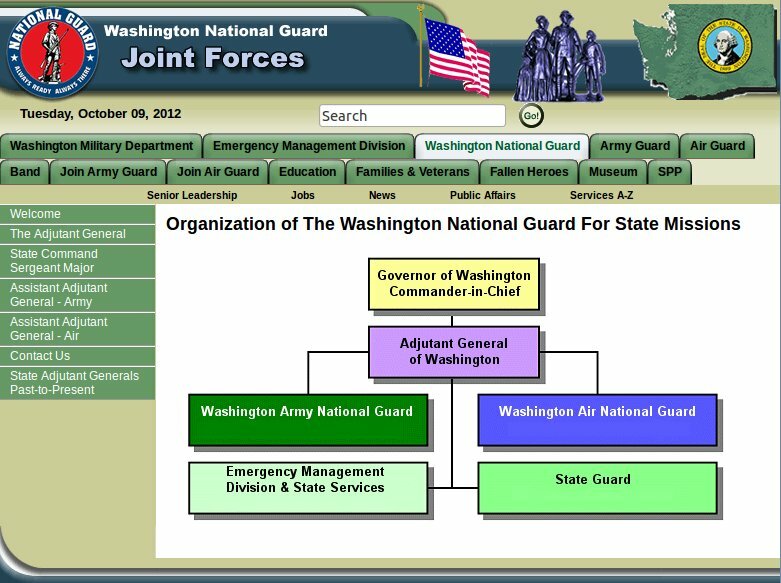 TaoSecurity: Washington National Guard: Model for Cyber Defense? 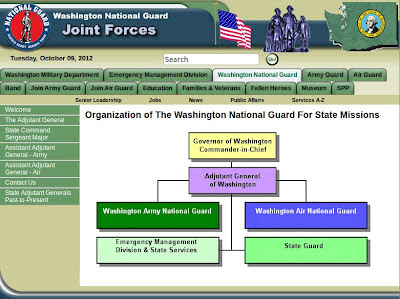 Washington National Guard: Model for Cyber Defense? “Just as ‘Business X’ needs the National Guard to come in and fill sand bags, ‘Business X’ might need to call the National Guard if it’s overwhelmed on the cyber side,” Welsh said. The new task plays to a growing strength in the state’s National Guard, which draws on employees from companies including Microsoft and Amazon to provide special expertise in its network warfare units. "The WSG is an all volunteer force that is a state defense force, with what is typically an emergency management mission. See Title 38 of the Revised Code of Washington (RCW). WSG is also authorized by Federal law, Title 32 of the United States Code. We most often serve as liaison officers in support of the Emergency Support Function (ESF) 20 (defense support for civilian authorities) function per Federal Emergency Management Agency (FEMA) National Incident Management System (NIMS) / Incident Command System (ICS) guidance during major events (disasters, natural or human caused). WSG remains a place where extremely experienced soldiers who have exceeded age requirements for active/reserve service can continue to serve as well as folks like me with no prior service who can't get the federal services to consider them for age reasons. We can be called to active duty but in-state only. I was on active duty with orders for two days in June for a major statewide exercise. When we're called up for such activity we become peer in rank and responsibility to our National Guard counterparts. I'll also be seeing some active duty time again in the immediate future in support of the initiatives mentioned in the article." I think this is a great start on a journey towards applying private sector expertise to national digital security problems, but on a local scale. The News Tribune article mentions that the Guard (in all its forms) is working to figure out how it can provide help to besieged companies, from a legal and logistical perspective. "We're not going to wait for the feds to hand us everything," Welsh said. In our Federal system, we should allow the States (per the 10th Amendment) the freedom to innovate, and thereby invent multiple approaches to fighting digital threats. wait. you know PVT Mcree? The effort in Washington state is a replication of a similar and more mature effort in Virginia. Richard, if you are interested in details please contact me. Taosecurity at gmail dot com ? Wow. This is the first that I've heard of this -- has anyone heard of other states involved in this beyond the WA and VA? Couldn't this become a slippery slope, though? Would the Governor have to be the one to mobilize the "cyber troops," as it were? when i swore in to the state guard, i promised to obey orders from the Governor and the President. Both. I trust my chain of command to reach out to me when EITHER CIC is in need.